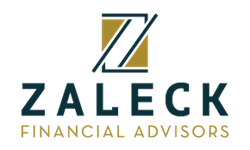 Craig is the founder of Zaleck Financial Advisors and has over 20 years of experience in the financial services industry. Before starting his independent firm, Craig worked at large institutions including Merrill Lynch and Goldman Sachs and obtained his CPA designation. Today, he uses this past experience to collaborate with individuals and families to help them pursue their financial goals. He works on comprehensive financial plans and plans focused on a specific need or area, which may include retirement, estate, and college planning. He also provides income tax preparation, tax planning analysis, and life insurance suitability needs. Craig enjoys working with his clients every day and helping them understand the various areas of financial planning. He works with them to develop paths in line with their financial goals and is a CERTIFIED FINANCIAL PLANNER™ (CFP®) professional, which means that he holds himself to a high standard of ethics and transparency. Craig also has a BS in Accounting and is a Certified Public Account (CPA). Craig lives in Chatham, NJ with his wife and three children. When not in the office, he can be found coaching his children's athletic teams or training for his next triathlon. He is also the President of the Chatham Softball Club, which is a non-profit organization that is responsible for fielding the town's recreation and travel programs.